Many gardeners use mulch as an effective gardening and landscaping tool. Far more than just providing ground cover that you don't need to water or weed, mulch offers many benefits to your lawn and garden. For one, when applied correctly it deters pesky weeds. Additionally, if you live in a dry region mulch provides a medium that absorbs some of that moisture. The question for novice gardeners, however, is which type of mulch is best? The answer to that question will depend on your weather, soil, and plants. Save your wood scraps--use them for mulch. Cedar is one of the most popular mulches and its very readily available throughout the United States. The main reason gardeners love cedar is because it helps repel harmful insects, and also doesn't decay quickly. This durability makes cedar mulch a little more expensive than pine. Cedar, like all mulch, acts as a soil insulator that reduces erosion and improves moisture retention. It will not break down as quickly as pine mulch, meaning if you're looking for nourishment, this may not be the best choice. Also, for landscaping purposes cedar mulch looses its color fairly quickly. For the green household, cedar is a fairly renewable, being a hearty tree that is able to grow in many regions. 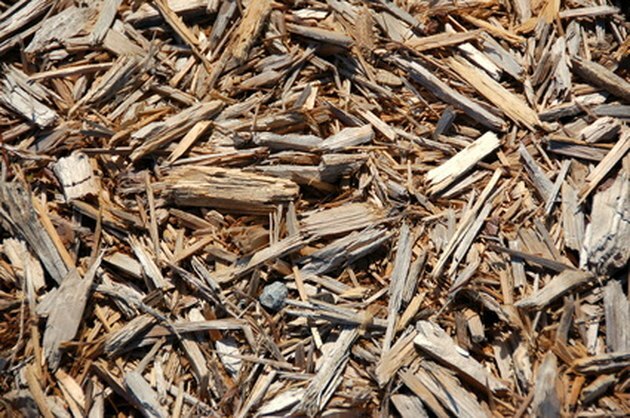 Pine mulch is made from the bark of pine trees. This mulch comes in a variety of sizes ranging from small shreds to large nuggets. While pine bark won't last as long as cedar bark, it is also not as costly and offers the advantage of not compacting over time and nourishing the soil as it decomposes. Also, you'll find it retains its color better than cedar, making it a better choice for landscaping projects. If you want stronger root beds for plants that like high acidity--use pine. No matter what mulch you choose, figuring out how much you need for a project can be difficult. Generally you can save a lot of money buying in bulk. Bulk mulch is sold by the cubic yard (or 27 cubic feet) whereas bagged mulch usually has only 3 cubic feet of material. That's not going to cover a lot. Consider that to cover a 10 foot by 10 foot area with 2 inches of mulch, you need 17 cubic feet, so you're already close to a bulk-sized order. By the way, there are sometimes calculators on home and garden store websites that will do all the math for you. All you need to know is how much space you want to cover. How much mulch you apply to an area depends on what you're trying to accomplish. A general rule of thumb for effective weed control you'll want at least 3" of mulch over the area. Note, don't just toss this down on the ground. Make sure you weed first, then cover (or if you want even longer protection apply a layer of landscaping cloth followed by the mulch). When you're mulching around trees, you want to leave a little bit of breathing room at the base. Having the mulch right on top of the tree trunk can cause decay. When the bark decays, it invites pests. The best time of year to apply mulch is in the early spring. That can nip weed growth before it even begins. Also, if you're planning to fertilize, do that first so the plants get the most benefit from the nutrients, then layer on the mulch. Either cedar or pine mulch will help keep your plants safe in harsh environments. Mulch maintains a more consistent soil temperature, keeping it cooler in summer and warmer in winter. While it offers that protection, it also retains ground moisture without saturating your plants. If you buy organic pine or cedar mulch, these will slowly break down and become soil-like. As they do, they are nourishing your plants. When added to a lawn mulch decreases soil compaction that otherwise makes for a mushy-feeling yard. 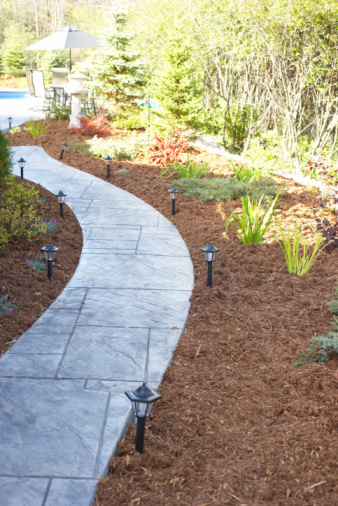 Overall mulch is a very affordable landscaping touch that brings even color to a garden, all the while doing double-duty to promote healthy root growth.